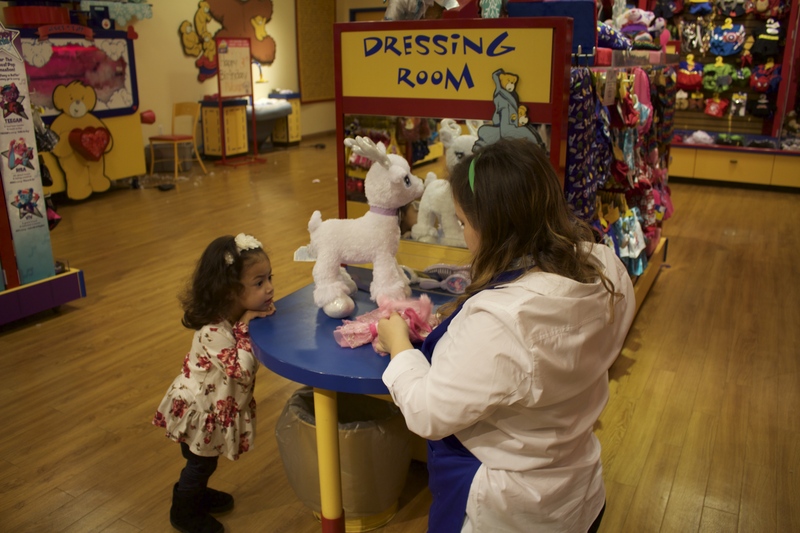 Hello Everyone, recently we got the opportunity to surprise the girls with their very first trip to the Build-A-Bear Workshop and experience the BABW just in time for the Holidays. We made it an exciting anticipated surprise for them and when they got there their faces were so full with joy. It was such a heart felt experience to see them so happy to be there. 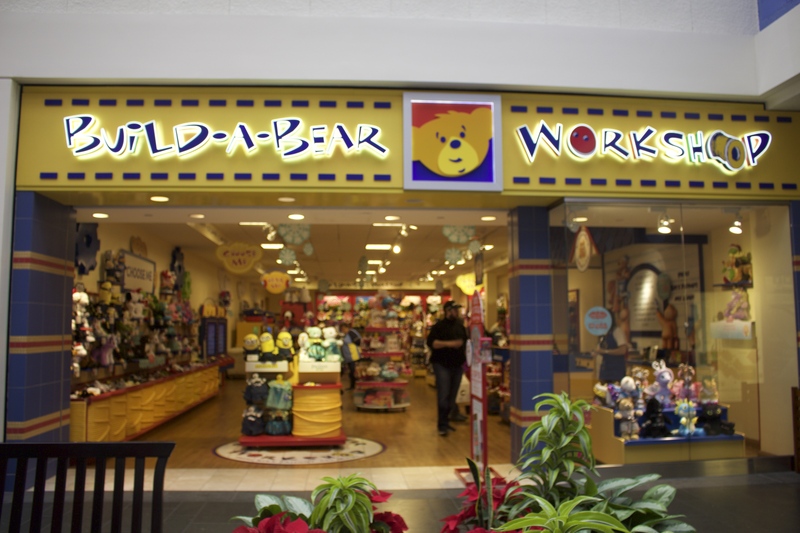 The Build-A-Bear Workshop stores work in a Giant circle, everything is super easy to follow. At the Build-A-Bear Workshop everything is easy to see and very neatly organized for the child to be able to visually see it all. 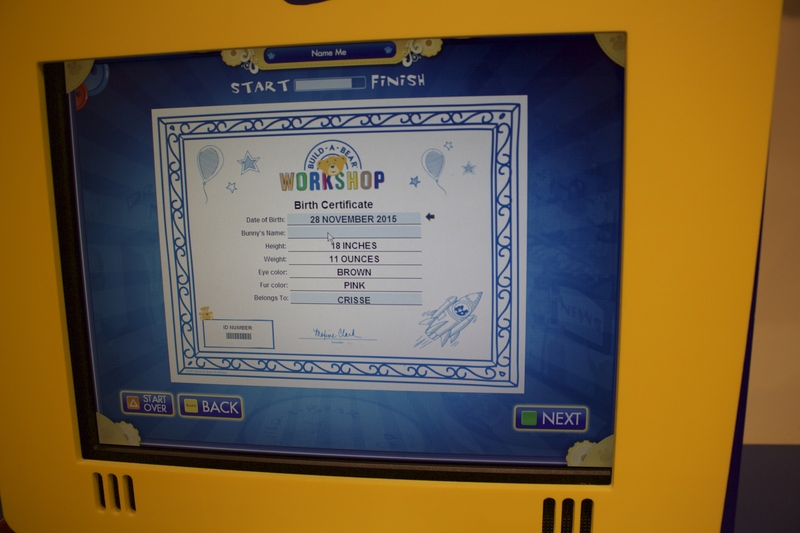 The workshop allows children to express their personality and show their creativity in building the right Build-A-Bear friend. 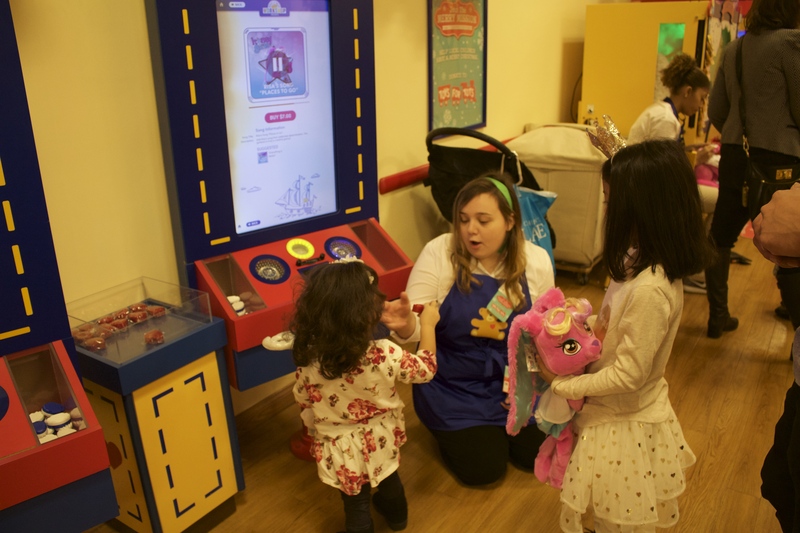 The first thing the child has to do is choose their special Build-A-Bear friend, They a a huge variety of stuffed animals,characters and dolls. During the Holiday season they have special Holiday friends. We saw The Grinch and Santa’s reindeer too. 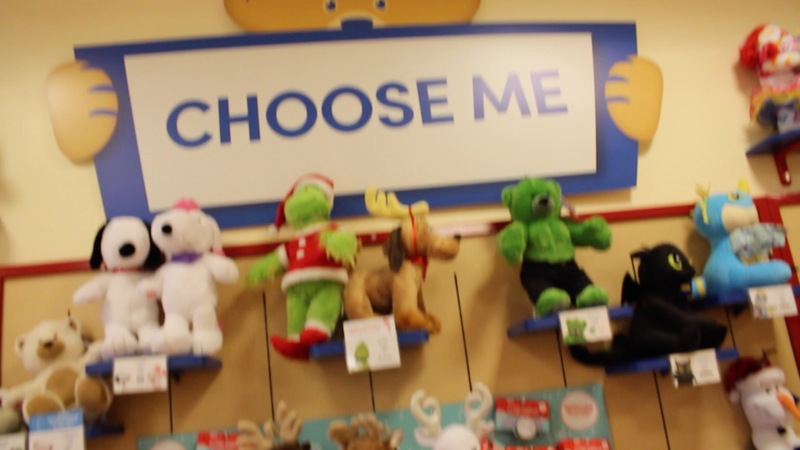 The child choosing their Build-A-Bear is super special and gives them great confidence in making their own decision. 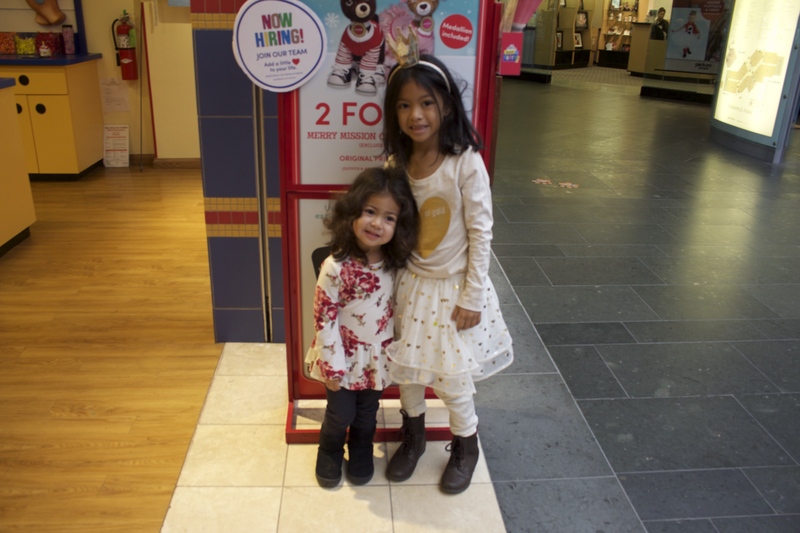 My girls Kayla (6) and Annalee (2) both choose totally different friends. Kayla went for Honey Girl Risa the Pink Bunny in left picture. The Honey girls are Risa,Teegan, and Viv a group of three girls who attend school together and formed a Band together. The Honey girls empower girls to embrace each other’s skills and talents. 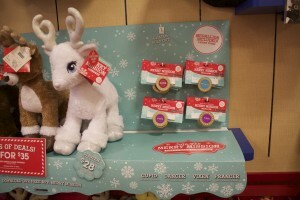 Annalee choose Glisten the White Reindeer on the right photo. She is full Holiday cheer with her new little friend. I think Annalee loved the Reindeer because she is really into horses at the moment she was so happy to find out that her antleirs light up with the push of a button. 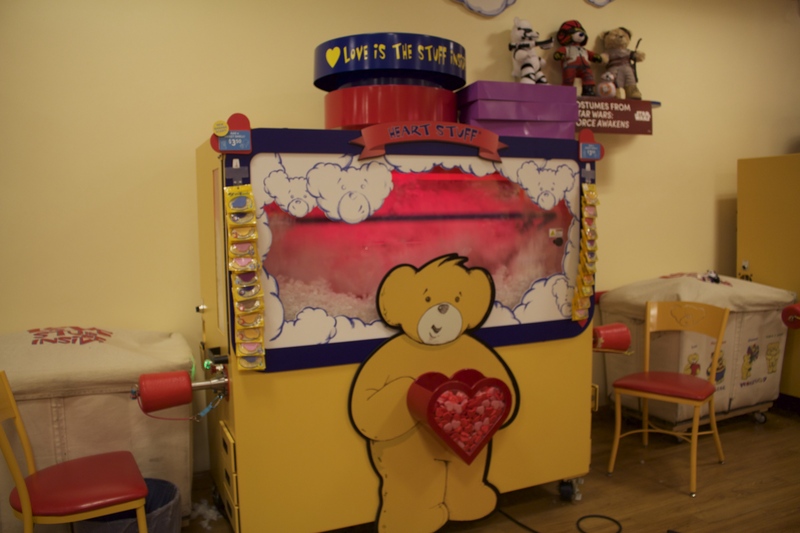 Once the girls had choose their Build-A-Bear friends they headed over to the sound recorder station to pick a beating heart for their stuffed plush and recorded a special tune. Kayla choose the Honey Girls theme song. It’s an upbeat rock song just perfect for her Rockstar friend Risa. 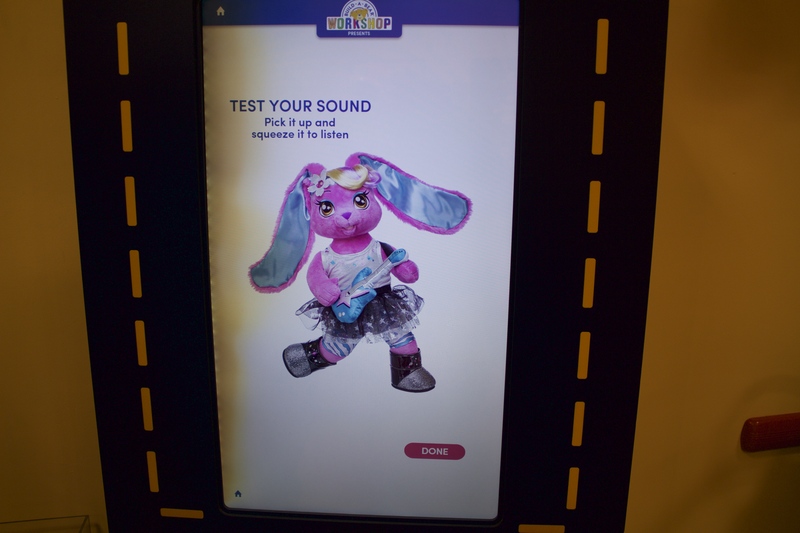 Recording a Build-A-Sound message is so much fun for the Child because they get to choose from hundreds of songs or simply recored any ones personal voice to make the experience more personalized. Additional 8.00 dollars. The girls had a heart ceremony that was fun and silly. 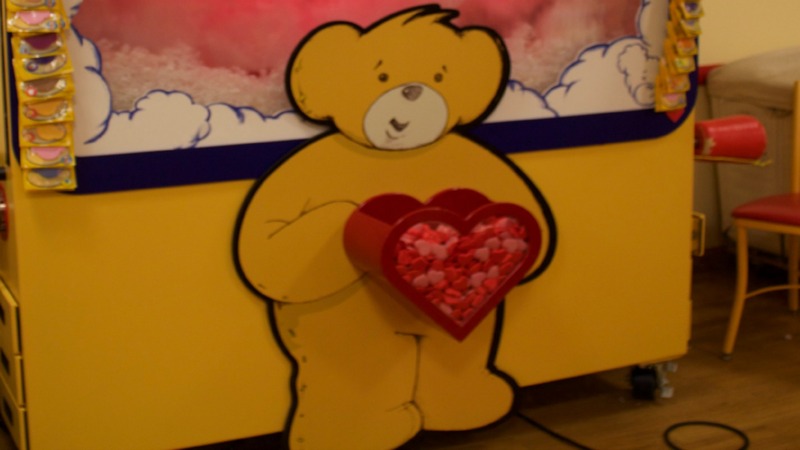 Before they placed the hearts in their Build-A-Bears. Kayla choose a special Strong heart for her Honey girl and the ceremony was to shake their hearts,Rub the heart on their muscles to make them super strong,Karate moves so they know Karate, Rub on head to make their mind super strong and Guitar moves so Risa is a strong Guitar player. My favorite was when she said Rub it on your knees so they always need you and on your toes because your totally awesome. Haha so cute. After sound is in check and recording was finished. Hearts were placed in their friends and the girls moved on to the best part yet. THE STUFFING OF THEIR BUILD-A-BEARS! They helped out by placing their foot on the stuffing pedal and thats when their special friends came more to life. They squeezed them and hugged them to make sure they were just right. Stuffing Station! Bears are stuffed with just the right amount of stuffing. Their Buid-A-Bears were stuffed and then they walked over to the Fluff me station. 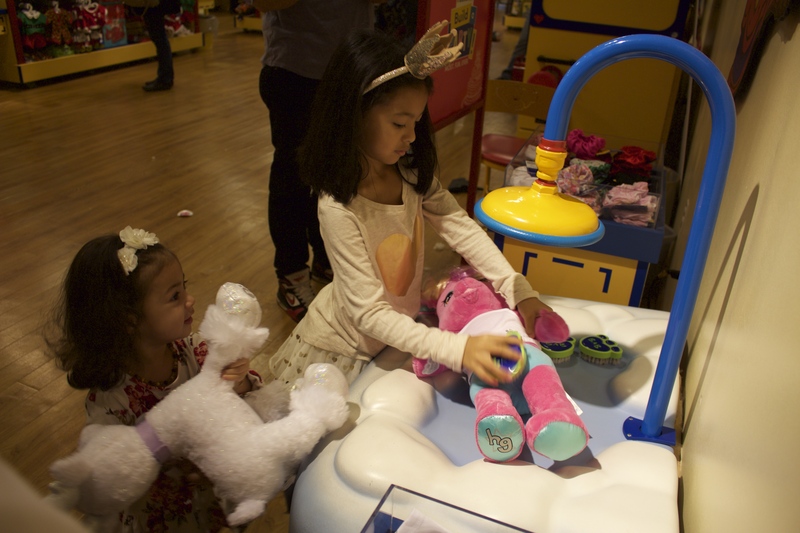 Where the girls brushed their stuffed animal to make sure their new friend were well groomed. Honey girl and Glisten the Reindeer were ready to get all dressed up in the latest Furry Fashionable Outfits. There were so many different types of outfits and shoes to choose from. Just take a look at all those amazing Holiday Outfits. Once the outfits were just right! 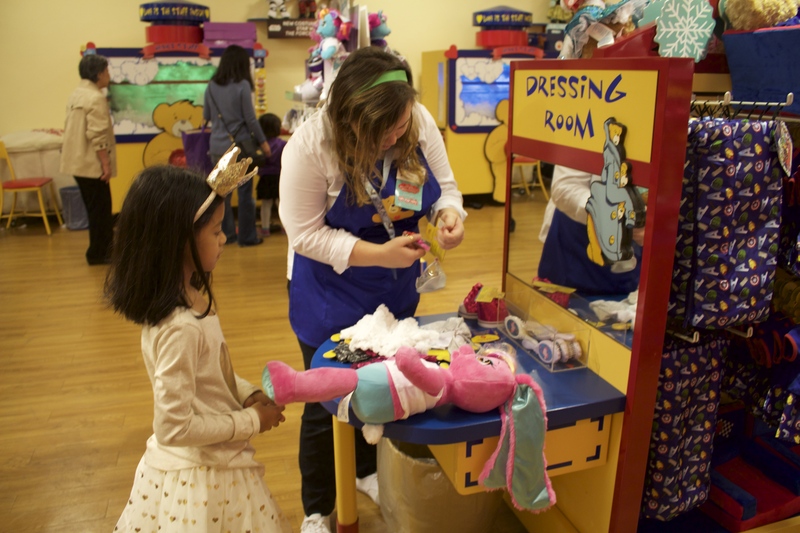 It was time to hope over the Dressing Room and for the girls to dress their Build-A-Bear friends with their clothing and shoes. Kayla even accessorized her Honey Girl with her very own Microphone. Annalee had her own special time with her friend Glisten in the Dressing room as well. 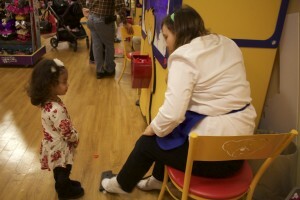 She was helped by our Build-A-Bear associate to dress her reindeer in her Pink Holiday dress and shoes. 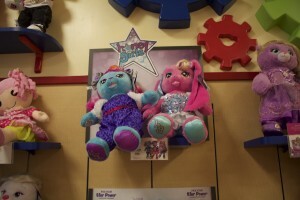 The Build-A-Bears could not come home with us with out their one-of-a-kind Birth Certificate. This has the bear’s Date of Birth, Name (can be personalized by child), Height,Weight,Eye Color,Fur Color and Name of who the bear Belongs to and the person who helped stuff it. We now have it hung in the girls room and they love looking at them once in a while. 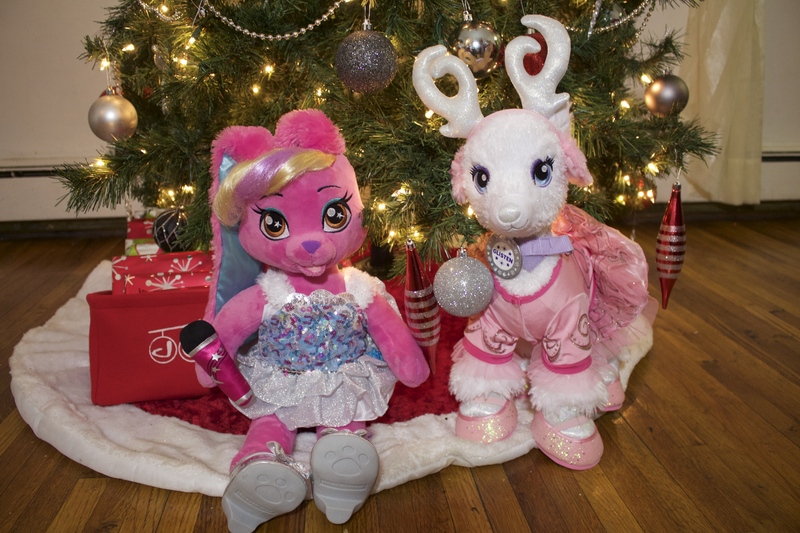 Build-A-Bears are a perfect Gift for the Holiday Season!